Enviro Concepts Oil Water Separators are compact, industrial and engineered for low-flow, high oil and grease applications. 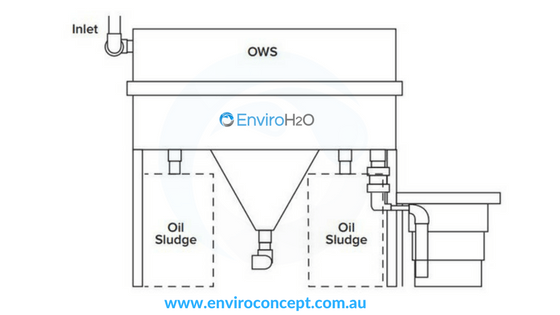 Enviro Concepts Oil Water Separator (OWS) range includes coalescing plate or tube separators. They are suitable for vehicle wash bay and industrial wash effluents. All OWS units are pre-engineered, pre-assembled and factory tested minimising on-site installation and start-up time ensuring reliable operation. Enviro Concepts OWS range features a removable and uniquely designed cross flow non-plugging coalescing plate packs which maximise oil and grease removal (up to 95%). The OWS design is versatile enough and can be installed as a “stand alone” treatment or as a primary treatment in a complete wastewater treatment or recycling system. To visit Enviro Concepts Oil Water Separator Page, click here. Please download our specification sheets here. For a FREE ESTIMATE on our oil water separator or water treatment discharge system, contact us now.